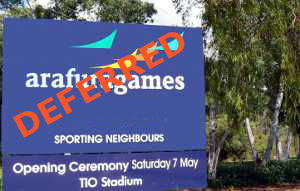 Arafura Games have been 'deferred' by the new Liberal Party Minister for Sport and Recreation, Matt Conlan. 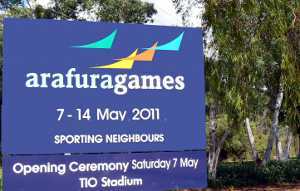 The 2013 Arafura Games has been deferred as the Government seeks a re-vamped model of the Asian Engagement Strategy. Minister for Sport and Recreation, Matt Conlan, said this decision was not taken lightly, however is a result of the Games losing their significance as a major sporting event in the region. "There are now several sporting events in the Asian region and the current model of the Arafura Games is failing to attract numbers," Mr Conlan said. In the late 1990s the Games attracted nearly 3000 participants and this number fell to around 2100 participants last year. "The potential to use the Games as a platform to build relationships and strong ties with our Asian neighbours was not recognised by the previous Labor Government,"Mr Conlan said. "The former sports Minister sat on his hands for far too long. The Games have been fast approaching, yet there were no secured suppliers, venues, or marketing for the event. "Labor's $900 million fiscal imbalance has left this Government with few funds to bring the Games up to the standard they should be." In 2011, the Games cost taxpayers $3.5 million with a similar figure expected for the 2013 Games. "The announcement to defer the Games will cause minimal disruption, with registrations not yet open to the public and the large majority of sponsorship contracts not finalised," Mr Conlan said. "This difficult decision to defer the Arafura Games reflects the events decline over the past decade and not the Governments overall approach to major events in the Northern Territory."